The famous census of England made for William the Conqueror between 1086 and 1090 was an unprecedented accounting of all property in the kingdom. The conquered Anglo-Saxons called it 'Domesday' because its authority was so absolute that it was like that expected at the Last Judgement or 'Doomsday'. Property of course changes hands, but updating the massive Domesday was not practical, and parts of it remained relevant, but finding the relevant bits for individual judgements would have been daunting. Abbreviated versions were created as finding aids for looking up the really important information about landholding, manors and titles. No one knows why a remote Welsh monastery had a copy, but possibly it was because of the patronage of the nationally powerful nobleman, Richard de Clare, whose family may have needed it as political tides shifted back and forth in the mid- to late 13th century. When it became outdated, one of the Clare family may have given it to the abbey possibly for safekeeping. 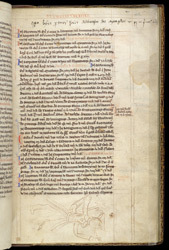 At the top of this page, the inscription states that the book belongs to the Abbey of Margam. Records for Gloucestershire are presented on it. This section has many notes in the margins. This level of interest may have been due to the Clare family's position of earls of Gloucester. The sketch in the lower margin may relate to other marginal drawings in the manuscript which appear to depict royal and noble figures.